15A fuse holder for 22- 33 volt circuits. 15A fuse holder for 4 - 6 volt circuit. 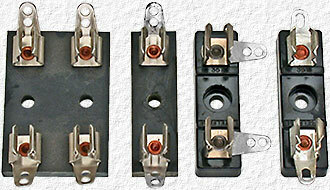 15A fuse holder for 90- 250 volt circuits. 20A fuse holder for 90- 125 volt circuits. 4 new & 2 used like shown in the photo & 2 more used ones with recessed screw holes like Style M4.